"VAIO" P is a new pocket style pc among the series of Sony's personal computer brand "VAIO" which first went on sale in 1997. 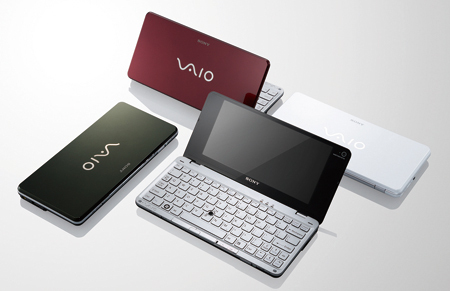 It is classified into the category of "laptop personal computer", but it specializes in the use of basic service on the internet, thus having a huge "simplicity" character which was not seen in the past lineup of "VAIO", meaning desktop type, notebook type, PDA type (personal digital assistant). In terms of design, it is compact, lightweight, simple, and yet the exterior gives a luxury feel. There are 6 color variations (black, red, green, etc) and has a gloss finish which gives a high quality feel, and also a matt finish. Also, screw holes on the bottom have been removed, refining not only the practicality when carrying around, but also the appearances. The design theme being "Carry around fashionably", this product targets a completely different type of users from the conventional business-like mobile personal computer. The willingness to establish a new genre of PDA with design, where functionality and price counts the most, is sincere yet refreshing.